This is a ‘Gradient’ range which is the brother to the much more famous ‘Herald’ range manufactured by R.Russell & Sons Ltd, Peel Foundry, Derby. 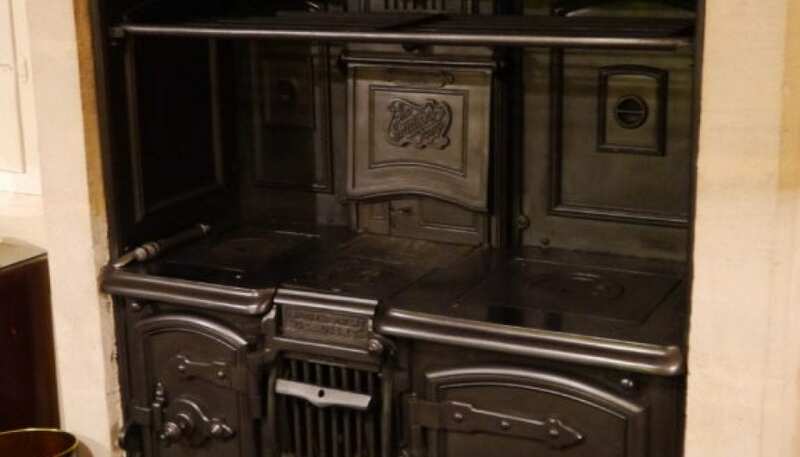 This was a later addition (circa 1915) to a Georgian property in Bath and likely replaced the original roasting grate. As you can see the original central arch that is flanked by both hotplate and copper has been squared off to receive this range. This range had laid dormant since the 1960’s when the kitchen moved to the first floor. It still had pots and pans on the top plate and baking trays in the oven when we came to do our site visit. We were asked to bring it back to working order but before we got started we had to have the chimney cleared. The job took all day as five decades of birds nest and general detritus was removed and bagged before the chimney could be swept. It was a mammoth task but the range is now happily at home and in use once again.